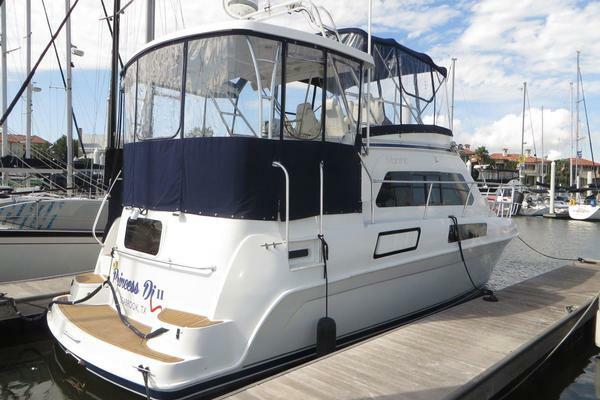 (LOCATION: Bradenton FL) This Maxum 4100 SCA is a roomy cruiser that features a spacious flybridge, covered aft deck, open salon, full galley, and two staterooms to insure room, comfort, and convenience. On deck we start at the top with a flybridge with radar arch and bimini top. The centerline helm station has extra wide helm seat full instrumentation and electronics. Forward of the helm is a roomy guest lounge. The bridge provides ample room for family & guests and there is more room a few steps down with an enclosed aft deck with hard top. It features a casual seating or dining area, wing door access to the side decks, and stairway to an integrated swim platform. The aft deck provides plenty of room to relax or entertain. The carpeted salon is bright, airy, and inviting. As you enter the salon you find a large leather settee to starboard. 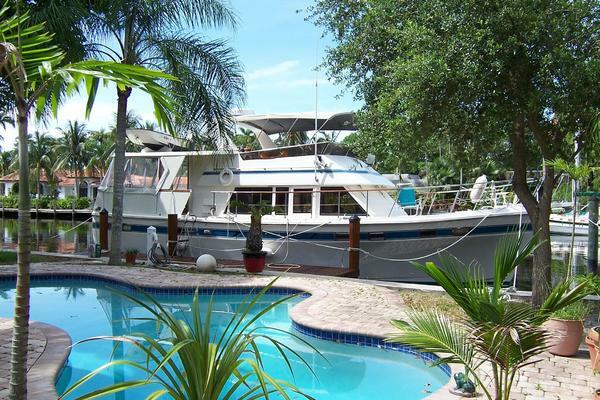 Port side is an entertainment center with television, Bose surround system, and wine cooler. Next to the center is a convertible booth style dinette. The galley is down features upper and lower cabinets, a full-size refrigerator/freezer, electric cooktop, microwave / convection oven, coffee maker, and counter with stainless steel sink. There are two luxurious staterooms. The forward guest stateroom features a queen berth, cedar-lined hanging locker, TV, and head compartment with vanity and shower stall. The master aft stateroom has queen berth with cedar-lined hanging locker, TV, and ensuite vanity with separate head and shower stall compartments. This 41 SCA is equipped with twin Cummins 330-hp Diamond Series diesel engines. Mechanical features include Westerbeke generator, three-zone reverse cycle HVAC, and Halon fire suppression. She is very clean, well equipped, carefully maintained, and ready to cruise. Call now for more information and to schedule a showing of this Maxum 4100 SCA. A sense of command is evoked by the grandeur of the lofty flybridge, set back from the signature profile and radar arch of the Maxum 4100 SCA. The command bridge has ample seating, with full ergonomically engineered instrumentation at the helm. The captain is never far from the conversations of guests, as they roam from the four-person lounge in front of the command position to the spacious covered aft deck. Below deck, passengers feel pampered by the sumptuously inviting salon with its open spaces, interrupted only by an elegant dinette with its convenient entertainment center and built-in Bose sound system. Guests will be impressed at the cutting-edge sophistication they?ll discover at every turn. The luxurious mid-stateroom, which boasts a queen-size island berth, storage drawers, and hanging lockers conjures up visions of long, leisurely voyages to exotic destinations. As does the equally elegant forward stateroom, with its queen-size berth, as well as ample stowage spaces.